For mothers seeking to reclaim their body after having children, tummy tucks are a popular choice. The "tummy tuck," or abdominoplasty, has always been a popular procedure, but recent history has seen a massive increase in the number of procedures performed, and the demand continues to rise. One of the fastest growing reasons young women are turning to the surgery is to regain their pre-pregnancy figure. For many women, diet and exercise are simply not enough to deal with the problems of excess skin and torn abdominal muscles that follow pregnancy. For these women, a tummy tuck is the only way to handle the problem. Giving birth is one of the most wonderful experiences in life, but it comes at a price. A lot of women experience some sagging in the lower area of their abdomen after delivering their child. Unfortunately, no amount of exercise and diet will be able to make this pouch completely disappear. This is often because of two distinct contributing factors. The first is that much of the affected area is excess skin that has no where to go. The other, larger problem, is known as diastasis recti. Diastasis recti refers to when the right and left halves of the abdominal muscles (the "six-pack") spread apart. The tissue that connects the two halves of the ab muscles begins to stretch as the baby grows and your uterus expands, pushing against the abdominal wall. Pregnancy hormones add to the thinning of this tissue by making it softer and more pliable. A small amount of widening along the mid line is normal and expected in all pregnancies, but a separation of more than about 2 centimeters is considered a problem. Diastasis recti can happen at any time during the second half of pregnancy, but is most common after childbirth. This is because the abdominal wall slackens, and the thinner mid line tissue can no longer support the torso and internal organs. This results in the appearance of a paunch or pot belly. Though diastasis recti occurs in only about 30% of pregnancies, there are a few mitigating factors that increase its probability. Genetics can play a large role in developing the condition; for some women, it's simply how their body responds to pregnancy. Women who experienced diastasis resti in an earlier pregnancy have a significantly higher probability of experiencing it again, and more severely, in subsequent pregnancies. Lastly, women expecting more than one child, petite women, and those with poor abdominal muscle tone have the highest risk. Thanks to the excess skin created by your belly expanding to suit its growing tenant, the stretching of the mid line tissue between your abs, and any possible further weakening of the lower abdominal wall as a result of a Cesarean section delivery, your tummy may never be the same. Diet, exercise, and skin treatments may help, but for many women the extra skin and paunch are there to stay. A standard tummy tuck is specifically designed to tighten the ab muscles, remove excess skin, and contour the lower abdomen. While it is a routine procedure, it is also remarkably extensive, resulting in long recovery times and more discomfort than many other cosmetic surgery procedures. There are a few variations to the procedure, depending on whether or not you have diastasis recti, its severity, and how much extra fat and loose skin you have. Most women can expect a minimum of 10 to 14 days before returning to normal activities. In a traditional or full adbominoplasty, a horizontal incision is made between the pubic bone and the belly button. This incision can vary in size from a few inches to the entire length of the abdomen, depending on your anatomy and needs. The skin is then pulled back, excess fat is removed, and the ab muscles are repaired (if necessary). The skin is then pulled down, a new belly button is created, and the excess skin is removed. The result is a tight tummy with no flabbiness. The scar is low, and is easily hidden by underwear or bathing suits. 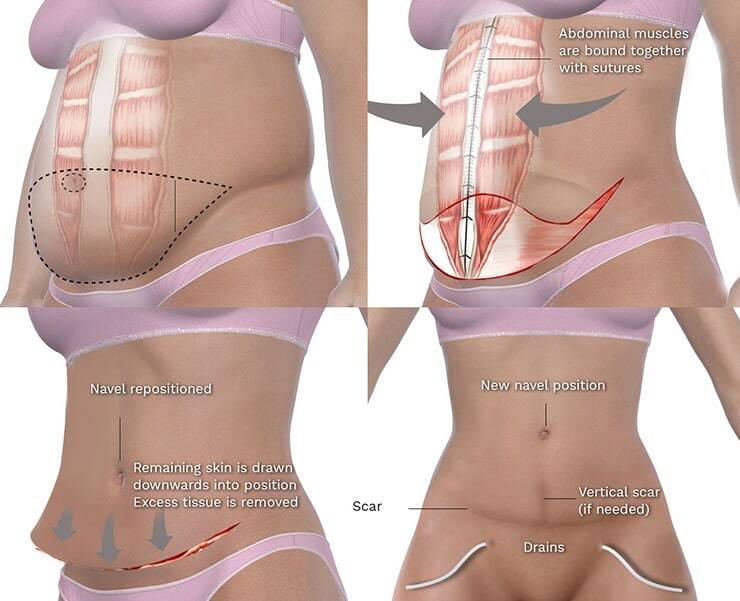 For women who have Cesarean section births, the incision can be made at the same location so there is only one, low scar. The best time to schedule your tummy tuck is once you've realized that a healthy lifestyle won't improve your body contour. You should wait at least six months after you give birth, or if you're breast feeding, six months after you stop. There are many reasons to wait the six months, and the first is that you simply won't be healed enough before then. The deep tissues in your abdomen have been stretched and ripped as a result of carrying a child to term. After six months, most of the stretching will have healed, and the pregnancy hormones that soften them will no longer be active. Once this has happened, the ripped tissue will hold together better and heal more efficiently after the procedure. Another reason to wait until six months after childbirth is because new mothers have to lift their growing babies often. Frequent heavy lifting puts undue stress on a healing tummy tuck, and can damage the results. By six months, most moms have figured out their routine, and can be much more efficient with lifting their children. Lastly, if you will be breastfeeding, it is best to wait until six month after you wean your child. When you breastfeed you transfer whatever is in your breastmilk to your nursing child. Under normal circumstances this is safe, but there is a risk to the child when the mother is given an anesthetic. The goal is, of course, to return to your pre-pregnancy weight, and while this is often attainable through diet, exercise, and lifestyle choices, sometimes it isn't. When this is the case, a tummy tuck may be the answer. Many women even find it is easier to see the results of their efforts after their tummy tuck, when they are better able to workout without their loose skin and belly getting in the way.